While sipping on my coffee and taking in the cooler weather, I can’t help but reflect on how quickly summer has gone by. Last Saturday was my library’s last day of our annual summer reading program. Its end brought joy and chocolate to my fellow staff members and groans and less excitement from the kids and families. This program came about thanks to my teen advisory group. In the past, my library has done a LARP program involving zombies. My teens wanted to repeat the program, but we wanted to add a new spin- thus LARP on Mars was born. This program involved tweens thinking critically about how they would live on Mars and it invited those tweens to act out their life in space using role play. This program was one of the most complex programs I have had the opportunity to create. Since it was so complex, we requested registration and limited the program to twenty tweens. On the day of the program, I spent an hour working with my coworker to set up. Using masking tape, we divided up our biggest community room into six sections. 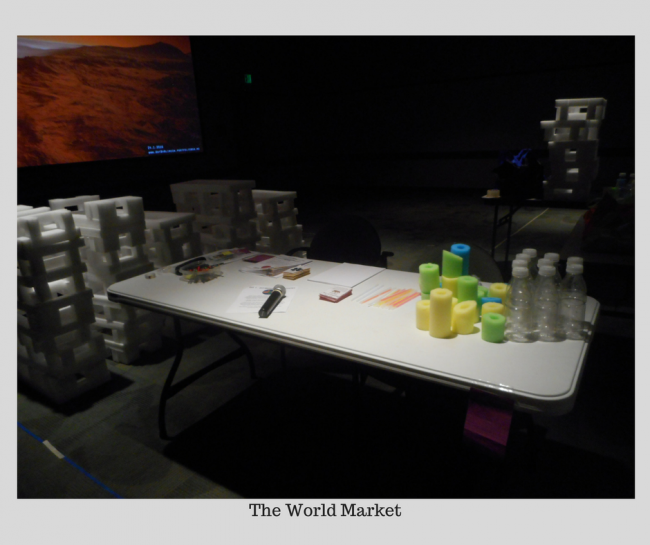 The sixth section in the center of the room acted as the World Market and the rest of the spaces were set aside for our participants to build their colony. Once we had the layout of the room setup, we gathered the supplies that each team would be using for their colony. Each team received a bag containing: a LARP on Mars welcome packet , a notebook, a pen, a recycled container with small craft pom poms that will act as the medicine kit, and a nonfiction book on the planet Mars. Next, we set out supplies in the world market which included: white foam building blocks, marbles, empty recycled water bottles, cut up pool noodles, and glow sticks. These supplies were stacked onto a table next to the World Market. As participants entered into the program, they were invited to get into groups of three and to go over the packet that was set out for them. The packet explained the program and what task each team member was responsible for. Every fifteen minutes represented a day and a new task or obstacle the tweens must overcome. Day 1: For the first day, teams began to establish their colony. The goal of the first fifteen minutes of the game was for the group to elect a leader and to create a character that they would be portraying in the game. We helped guide participants by prompting them with questions such as: What’s your character’s name? What are their fears and dreams? How did they end up on Mars? What is your relationship with the rest of the members of your colony? If teams had time, we encouraged them to draw a picture of their character. Throughout the whole game, we challenged teams to stay in the character that they created. If we saw them act out of their character, staff might say “check yourself.” This means that the tween has to evaluate what they are saying and doing and see how it fits into the character they created. Day 2: The second day marks the second part of establishing the team’s colony. With their character in mind, group members will assign a job duty to each member of the colony. Medic: this is the only player who is allowed to access to the medicine kits to heal sick players. One pom pom will cure a player of a sickness. If a player runs out, the player will work with the merchant to try to barter with other colonies for additional medicine or buy some more supplies from the World Market. Librarian: the librarian is the information seeker and the only player who can consult books for help. They were responsible for coming up with ways to handle the disaster situations. Merchant: was the only player who can trade or use money at the World Market. In addition to being assigned their job duties, players began to build their colony. For this program, we placed all of the supplies on a table next to the World Market. We invited teams to discuss and think about what kinds of supplies they would need. To make this more organized; the order in which the team picked their supplies was determined by rolling a dice. Whoever rolled the highest number was picked to go first. Once it was the team’s turn, the team leader was the only one allowed to get supplies and each team could only take 20 items. As teams worked, staff went around to each group and tried to get participants thinking about how one would support life on Mars. Some questions that were used were: How are you going to get air? Where will you go to the bathroom? How will you get water and ensure that it is safe to drink? To help answer these questions, the team member with the job title of librarian was allowed to look at nonfiction books on Mars to try and assist in the building of the colony. 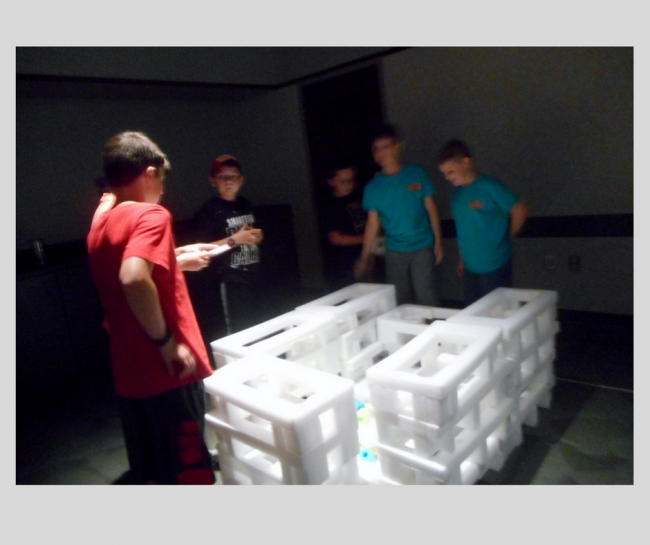 Since this day had a lot of tasks to complete, we gave participants extra time to build and establish their colony, and for the last 45 minutes of the program, we created obstacles for the teams to overcome. Day 3: Day three and beyond represented colony trying to survive Mars. Prior to the program, I created a deck of LARP CARDS with situations that each team had to try to overcome. Every 15 minutes, the leader would come up to the World Market and draw a consequence card. The team then had that time to deal with that situation. Some of the situations included things such as: a dust storm, a solar flare, and meteor shower. If we noticed teams becoming restless, we might prompt the whole group with an obstacle. If staff knew details about the character, we might also create obstacles for certain characters. For me, this part was the most fun. For example, one player told me that their character’s biggest fear was Taylor Swift and spiders. After I learned their fear, I created a situation where Taylor Swift visited their colony bringing a spider infestation with her. The team then had to role play this situation in character. This led to a hilarious sing off for everyone in the room. Even though this program was complicated to plan, it all boiled down to play, learning, and telling stories. Once the tweens go into their character and established their colony, they did not want the program to end. When we had to end the program, many of the participants went on to check out books about astronomy and STEM jobs. The program went so well, we did another session with teens and we are planning on doing it again in the future. It is a program you can personally tailor to your group and your budget. As another summer closes, I hope my library tweens will have many happy library memories to look back on. As I reflect on working with them, I know this program will be one of my favorites. 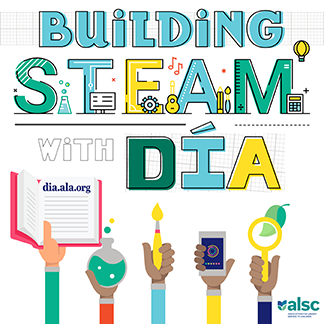 What was your favorite summer library program you did? This is such an exciting program, I can’t wait to try this out! Thank you for sharing Pamela. If I could ask, where did you obtain your foam building blocks for this program?